These original, artful K Kane earrings are the perfect present to celebrate a new last name or a milestone birthdayfor yourself or the one you love. Designed by hand and cut with lasers for fluidity and accuracy, this personal piece is ideal for becoming a signature look. Circular hoops feature two custom drawn, not computer generated, initials. 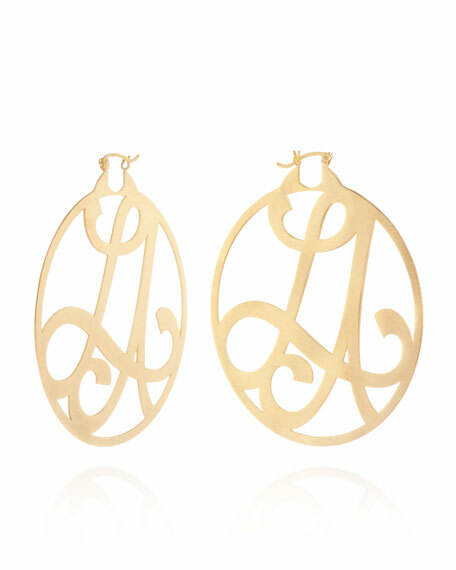 Perry small hoop earrings by gorjana. 18-karat yellow gold plated brass. Marquise cubic zirconia centers. post backs for pierced ears. Perry small hoop earrings by gorjana. 18-karat yellow gold plated brass. Marquise cubic zirconia centers. post backs for pierced ears. Approx. 1"L drop. Imported. Classic and contemporary all in the same moment, these Ippolita earrings will suit all situations. From the Glamazon collection. Shiny 18-karat yellow gold shapes hoop silhouette. Hand-hammered finish. Post backs. Imported.